Porcelain Jasper is a particularly beautiful variety of Jasper that can be identified by it’s unique swirl and orb like patterns of purple to deep red streaks on a creamy beige palette. No two stones are alike in pattern and color. It is composed of Chalcedony and gains its attractive colors from the presence of iron and aluminum. One of the special characteristics of Porcelain Jasper is its ability to take a very high shine polish, leaving it with a liquid appearance when fashioned into a bead or cabochon. It will cause admirers to wonder if they are beholding ceramic or stone, since it has such a perfectly finished appearance in its end result. Although Porcelain Jasper can be found in a variety of places around the world, with large quantizes coming from Mexico and Madagascar, there is a particularly special variety called Willow Creek Porcelain Jasper that resides in Idaho. In this location, the gem is found in a special type of rock called a “thunder egg” (similar to a geode) that is created when hot lava flows over a sedimentary rhyolite rock bed. The result is a softball sized very ordinary looking rock that contains a sweet gem surprise on the inside! One Native American legend states that thunder eggs came to be when the Gods of two mountains became angry with each other and began to hurl rocks that landed on the surrounding mountainside and valleys below. Eastern cultures have valued Jaspers as a symbol of the mysteries of life. Some people believe Jasper jewelry to be useful in building relationships with superiors and colleagues at work. This makes it a fun “out of the box” gift option for clients, bosses and coworkers. It certainly trumps a fruit basket or a pen set! Whether you are looking for a fine piece of Porcelain Jasper to boost your career or inspire you to ponder the mysteries of life, you’ll find some lovely ready to wear options by Layne Designs below. As a metal working apprentice, one of the first techniques you need to master is soldering, the technique of adjoining pieces of metal together. 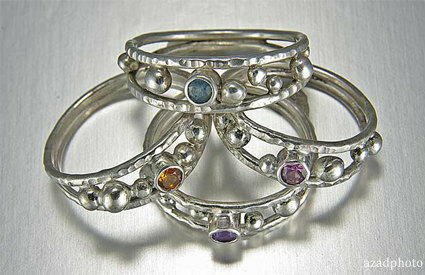 Soldering is a primary technique that is used in a wide variety of jewelry making practices such as creating settings for a gem, joining settings to components and affixing decorative embellishments to jewelry. Although it can be intimidating to pick up a torch and try your hand at the process the first few times, it’s essential to master good soldering technique if you hope to be successful in jewelry making endeavors. Taking a few minutes to gather some knowledge about the process will help beginner jewelers to gain confidence and also an awareness of what physical reactions are happening to create their finished product. In efforts to help new jewelers, like myself, I have outlined a few basic principles to keep in mind as you begin to learn soldering. Remembering these few guidelines will help apprentices to move along on their journey from newbie to expert with skill and clarity! Although soldering is a process used for many types metals, the materials used and temperature information is specific to each metal. Since Layne Designs uses silver through chip and pick soldering, I will speak specifically about silver and these techniques in this article. Silver solder is an alloy metal that consists of a combination of silver and tin, silver and copper, or sometimes all three metals. It’s alloy form allows solder to melt at a lower temperature than the silver itself, which is the key to the whole process. Silver melts at 1763 degrees Fahrenheit. Hard silver solder melts at 1330 degrees Fahrenheit and flows at 1475 degrees Fahrenheit, medium solder melts at 1265 degrees Fahrenheit and flows at 1390 degrees Fahrenheit, easy solder melts at 1235 degrees Fahrenheit and flows at 1325 degrees Fahrenheit. It works by liquefying, flowing into tiny open spaces in the silver, and then hardening once again to produce a chemically bonded, seamless and unified piece. The key point to remember here in the soldering process is always move from hard solder to easy solder when one has multiple soldering steps to accomplish. This will ensure that previous solders will not come undone through excessive heat. When heating silver, never let the metal become bright orange-red, as this is an indicator that you are over heating the metal and it is close to melting. Using a flux is also a crucial part of the process. Flux protects metal by blocking oxygen from reacting with the metal. Without flux, the flame creates a sooty layer that makes a strong solder bond unlikely. Flux also absorbs impurities and encourages flow of the solder as it melts. Be sure to coat your pieces well with flux in any areas where the flame will be used. Fluxes are also available in a spray form like Prips Flux. Remember that solder is most attracted to the hottest part of the metal. The principle to keep in mind is to heat what you want your solder to stick to. If it’s possible, a piece can be arranged with solder chips in place on your fire brick, ready for the process to begin. Often, it’s necessary to use a pick to place solder chips. In this case, heat the pick while picking up the chips, then make sure to heat your piece where you would like to place the solder. The chip will stick to the warmest metal. Use the white cone of the flame for best success in heating, as it is the hottest portion of the flame. Move in a circle around the solder or in an arc rather than focusing on the chip itself, keeping the heating principles in mind. This will ensure that your solder will flow evenly into the entire seam. Make sure to use enough solder to flow into all the seams. At the end, remove your pieces from the firing brick while they are still warm, so that the remaining flux does not cause them to stick to the brick. Dip them in a container of water and check for gaps or weakness in the seams. If all is well, your piece is ready to be pickled. If there are flaws, it’s back to the bench for some touch ups. 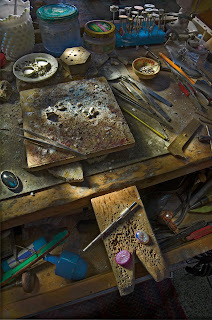 Mastering soldering is very rewarding and is the key to opening the doors of creativity. I hope this has been a helpful guide for beginners like me. Happy creating! Crazy Lace Agate, a type of Mexican Agate, is named for its stunning haphazard contour line and ripple designs that occur in a wide range of colors from creamy browns to deep blacks , sometimes interspersed with red throughout the stone. Many liken it to having a lacy effect or a paisley look. This beautiful variance is a result of the presence of several minerals in the gem such as Micro-crystalline quartz, banded chalcedony, iron and aluminum. It is opaque and somewhat chalky in its natural form, but does take a high polish that leaves a lacquered looking surface. 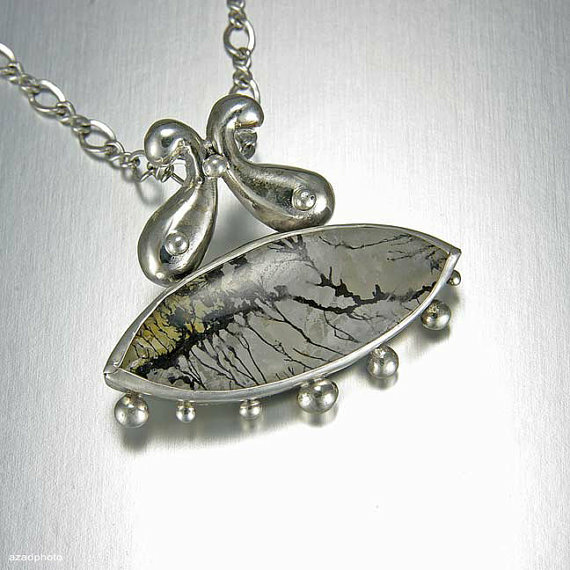 Jewelers prefer to use this gem in slices or cabochons to highlight its unique natural design that is so uncommon. Crazy Lace Agate is found only in limestone beds that date back to the Cretaceous period, making it between 90 to 65 million years old! This gem hails from Chihuahua, Mexico, the largest of the 31 states in the country. Although it was first discovered in 1895, the stone did not gain popularity until traveling hobbyist unearthed some particularly good specimens in the mid 1900’s along the side of a newly developed highway. This sparked an agate craze that is notable in the jewelry of the 1950’s and 1960’s. 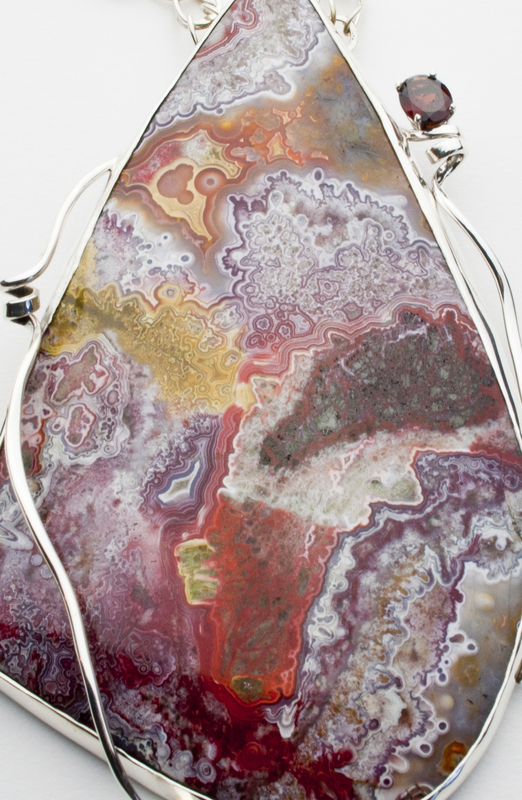 The beloved Crazy Lace Agate is known as the generational stone because it is believed to increase understanding and communication across generations, making it a particularly good gift for a grandparent or grandchild. Today’s gem , Seraphinite or Clinochlore, is a single source gem, coming to us from Baikal Lake in Eastern Siberia! It is name comes from the word Seraph (winged angel) found in the Bible, because of its feathery patterns that show well when the stone is polished. 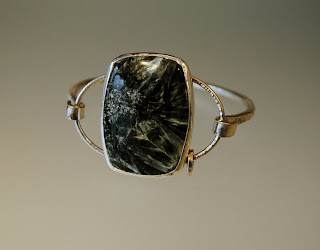 It is a mottled grey to dark green in color due to the presence of Chlorite and has silvery flecks of Mica that show chatoyancy, which is similar to the sheen that comes from silk. It registers between 2 to 4 on Mohs scale of hardness. This pretty rock is fairly new to the world, since it was reportedly discovered only about one hundred and twenty years ago by Russian mineralogist Nikolay Kolsharov. Other sources debate that it was not actually discovered until 1947. In any case, by geologic standards this is a recent discovery. Western markets did not have frequent access to the gem until the 1970s. In the metaphysical realm, Seraphinite is believed to strengthen chakras and enhance healing. It also aids in disease recovery by bringing the physical body back into balance. Some healers also think it to be useful in contacting Angels and increasing awareness of the divine. For care and maintenance at home, owners can use the same “rules” that are generally used for care of pearls. Avoid chemicals, solvents, abrasive cleaning tools and heat. Stick to a gentle warm water and soap solution and pat dry with a soft cloth. Summer seems to be the season of love, as is evidenced by the myriad of weddings that occur May through August. In addition to sharing the meaningful day with the bride and groom, weddings also give guests a welcome chance to see and be seen. Once the invitations are received, girlfriends and family members almost instantaneously will begin discussing the big question “what are you going to wear?”. Finding the perfect dress is of course paramount on many ladies minds. However, that fantastic frock will do very little for a woman without the right jewelry to enhance the overall look. But what jewelry is right for the occasion? Are there any “rules” to follow? Although I tend to shy away from giving any hard and fast rules when it comes to fashion because I believe it should be fun and creative, there are a few helpful principles to keep in mind when selecting your jewelry for a wedding. The first and most important of these is to keep the attention on the bride and the wedding party. It’s most often not possible to know what a bride will be wearing on her big day or what jewelry she may have selected for her girls. But, you can be sure that you don’t want to show up wearing the same jewelry set from Tiffany & Co. that she is, for example. Choosing one of a kind or handmade pieces is a useful way to make sure that your look is your own, and that there are no embarrassing duplicates floating around the day of the wedding. Also, as is true for dress selection, competing with the bride is a big “no no”. Make sure that your choice in accessories is tasteful and different so that there is no accidental “one uping” going on. Secondly, use the setting to inform your choice in accessories. Is the event at a ritzy, upscale venue? By all means, break out your high end, large gemstones to add some pizzazz to your outfit. Is the setting artsy? Perhaps an eye catching statement piece would be best. At a Garden or a Mansion? Think about using traditional pieces that compliment your dress. Pearls often a good fit for such occasions. Practicality is also an important consideration when dealing with hot summer days. Heavy or tight pieces that are perfectly comfortable in an indoor setting can quickly grow burdensome if you are spending hours at a reception in the outdoor heat. Finally, aim to look “expensive” as the judges on the ever popular “Project Runway” like to advise. You don’t have to actually spend a lot of money on your accessories, just choose pieces that you look like you did. Weddings are in most cases a semiformal occasion. Therefore, your accessories should reflect that mindset. Even at the most informal of weddings, no lady should look like she picked up her jewelry at the local dollar store on the way to event. Jewelry that includes genuine gemstones, precious metals, fine glass, crystals or artisan pieces are all good choices. Avoid plastics and cheaply made jewelry that’s better left for your everyday wardrobe. Above all, have fun and enjoy your look for the day. If you feel beautiful and glamorous, you’re doing something right. Below are some ready to wear pieces from Layne Designs that will help you complete your wedding ensemble. July’s birthstone is Ruby, making it a perfect time to review this beloved gem! 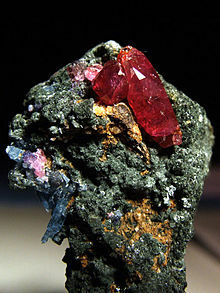 It’s name comes from the Latin word, ruber, meaning red. 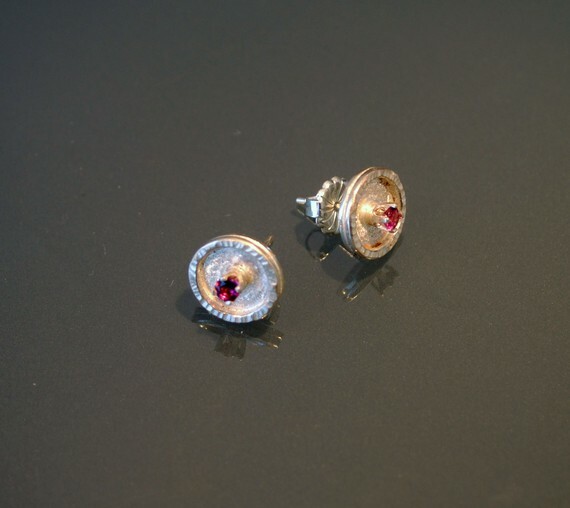 Rubies, also like Sapphires, come from the mineral Corundum (aluminum oxide), making these two stones “sister” gems. Rubies are often valued according to color, the most sought-after shade being a deep red “pigeon’s blood” color. Minimal inclusions and a glassy luster are also desirable qualities in a high end, natural Ruby. There are many myths and legends surrounding the Ruby, which greatly accounts for the long term popularity of this lovely gem. For many cultures, it’s stunning red color naturally associates it with love, romance and passion. Hindus believed that the colors of Rubies were due to an inextinguishable fire that burned inside the gem. This fire was thought to grant it’s wearers long life. Native Americans used Rubies for ceremony offerings in hopes to be reborn as a chief. Burmese warriors believed that Rubies would protect from injury and make a soldier unconquerable in battle. GoGoPop Trivia: Today's Trivia ~ Tuesday July 5, 2011: "The Dog Days of Summer ... our pooches chilling out on their porch stool. Today in History: 1996 ~ Dolly the sheep becomes the first m..."